We received lots of comments on 21 Things That Will Be Obsolete in 2020. To those who expressed doubt that any of those predictions will come to fruition, the writer Shelly Blake-Plock wrote an elegant response. But many more were intrigued by one commenter's assertion that many of those items on the list are already happening. So I asked the commenter, educator Gord Holden from Vancouver, B.C., to elaborate on those details. Four years ago I went from being a school teacher, to a position in distributed learning. The environment was "cutting edge" but many courses were still in paper format, and the online ones were largely electronic text. The cost of materials and course development translated into huge classes, and marking loads. "Each day is filled with new achievements and a growing following of engaged 'co-workers.'" Student feedback was both inadequate and not at all timely. Worst of all, my students were not engaged and had little meaningful contact with their teacher. After a year of feeling like a total failure I told the principal that I was dissatisfied with my teaching practice and needed to find a better way to engage the students in their learning. With her blessing, I began my search. It began by resurrecting some game programs that had met with great success in my classroom practice. Although I am not a "gamer" I knew it was important to steer clear of the "eye candy," and the "drill and kill" activities that call themselves games. I will recommend one here called Caesar III. In this simulation, students begin as a lowly citizen trying to eke out an existence in a virgin landscape. The student begins by learning about the basic needs for survival and graduates to increasingly demanding scenarios. By the end, students will have gained a very sophisticated understanding of the influence played by the environment on the development of a civilization. They will also have experienced the dynamics of government including infrastructure, civil service, taxation, education, healthcare, religion, trade, security, etc. Still, while games like this may have improved both the level of student engagement and learning, there was little opportunity for collaboration between students, and relationship with the teacher. It seemed likely that the next step would involve virtual worlds, where students and teachers could interact. The best resource I could find was put out by Caspian Learning, called Thinking Worlds. In it, a student enters into a virtual world that resides on their personal computer. Their avatar can be somewhat modified, and engage in a wide variety of explorations. In the unit dealing with volcanoes and earthquakes, they not only learn about the details, they visit places such as Herculaneum, subterraneous faults, and the ruins of Kobe in Japan. There, they gather information from the people and learn about what it's like to be in an earthquake and how one should prepare for it. In other units they interact with blood cells, astronauts, computer chips, medieval citizens dealing with the Domesday Book, Dracula, Louis the XVI, Hitler, and the list goes on. 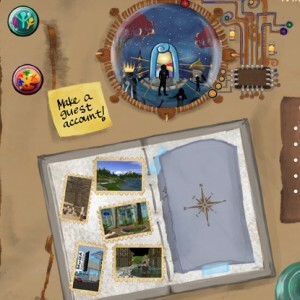 Students are able to redo these quests as many times as they need to in order to gain mastery. The feedback and marking is instantaneous, so they are able to know when they've met my minimum requirement of 90%. I hardly ever get a score of 90% though, students will invariably repeat their quests until they get 100%. And still, my quest for creating a community of learners was unmet. Until one day, when I'd all but given up, I saw a reference to a program called Quest Atlantis. In less than 15 minutes of researching this resource it was clear to me that I had found what I was looking for. In Quest Atlantis (QA), my students are engaged in a narrative as compelling as The Chronicles of Narnia, except not as passive spectators, but as active participants in the story. Their age and school appropriate avatars are able to explore and learn in an environment that is secure, monitored, and dynamically expansive. Through QA my students have gone to live with the First Nations people of Mesa Verde, negotiated plans to save the Black Rhino with the various stakeholders in Tanzania, taken rockets to space stations to learn about the technology they will need to deploy and use in order to deflect Near Earth Objects. In the meantime, they learn about Internet safety and protocols, how to build virtual buildings, and most importantly how to become a better global citizen. I cannot say enough about how QA has transformed both my teaching practice, and my students. While the founders, the Faculty of Education Learning Sciences division at the University of Indiana call it transformational play, the parents call it "Miraculous Play." The scope and depth of opportunities offered by QA is far too great to even attempt to do justice to it as part of an article. The learning I was bringing to my students was still very guided and curriculum based. Now, I was looking for even more, programs that would allow the students to be creative. With their Internet safety training, I could now put them on Wolfquest. In Wolfquest each student becomes a solitary wolf, struggling to find their place in the wilds of Yellowstone National Park. They learn about the challenges of life in the wild, and the need for "others." In time, they can mate, and form a pack of their own. What fun to watch the alpha males try to take down a bull elk. They cannot. They need the pack. What fun to watch as the "quiet ones" assume leadership of the pack, and the subsequent high fives when they successfully organize and conclude a hunt. What fun to watch my teaching colleagues attempt to do the same. We cannot. Where to now? Well, we've obtained virtual space on Cybernetworlds, a family-run virtual universe that I cannot say enough about. There, in Viamus, my students have been rebuilding the ancient civilizations that ring the Mediterranean. My students have also rebuilt our school virtually, as a place where they can come to pick up assignments, hang out, collaborate, even meet for classes. We have a number of other projects under development, but now, it is my students who are in charge. While they may have to run things by me, they are responsible to research what they are responsible to know, and find ways to use their newfound skills to build an environment where they can pass their knowledge on to others. Where is this going? The total cost of everything I've mentioned is under $700. Is the journey complete? Not a chance. I've gone from feeling completely defeated as a teacher, with students who were angry and resistant to schooling, to having each day filled with new achievements and a growing following of engaged "co-workers." I'm mourning the coming of summer, as each of my students has become invaluable as a colleague and an asset to our school. Has this miracle fallen from the sky? Well, I will admit to some serendipity, but will tell you that there has been no small amount of blood, sweat, and tears that has gone into bringing this about. I truly hope that there are some schools and/or school districts out there that would like to see similar results. It can be done if the passion, dedication, and careful planning is in place. I would love to be a part of that. How about you?